Amylulita says...: It's finally here! The official Nacotheque Summer Fiesta w/ Sunsplash (ex Todosantos)! It's finally here! 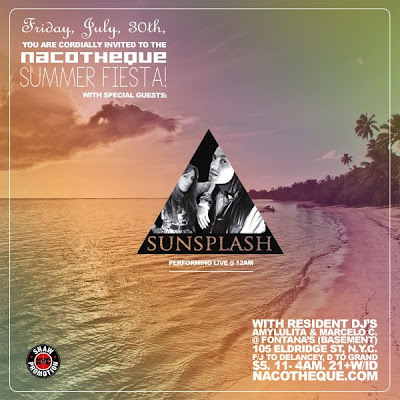 The official Nacotheque Summer Fiesta w/ Sunsplash (ex Todosantos)! It's finally here chavitos!! The official Nacotheque summer fiesta w/ a live performance by SUNSPLASH (ex Todosantos) and your favorite resident DJs Marcelo and yours truely. I'm decorating the Fontana's basement with inflatable props - pink flamingo, baby pool, and a huge plastic palm tree! I'll also be handing out squirt guns, lollipops, and mini maracas to some lucky party people. Sunsplash - Fiera de vinil. from Alberto Stangarone on Vimeo.